Reports are In! - Cheryl&Co. Home » Reports are In! Thanks to the Title Company of the Rockies we receive a market report developed by Altos Research called the Market Action Index. Glenwood Springs Market Report upward pricing trend to continue, oh great. Parachute Market Report prices trending lower, time to buy! The report that arrives in your inbox and playing with the MAI tool is fun. You can check a box to divide the report into market segments, and 4 color coded lines pop up corresponding to the 4 market segments. Each of the market segments represents Median Price and Sq ft and its great that all the lot sizes are residential-size so we know we are comparing like housing situations. When looking at a given report you can un-select the segments that do not pertain to the type of house you have in mind. The gray highlighting tool is fun because you can zoom in and check out the stats for a given set of weeks of the year. This makes it possible to do a comparison based on your own experiences, for example, “I remember I did great in the summer of 2015, is the market just as hot now?” and you can check. The market action index has a drop down menu that can show you median list price, average days on the market, price per square foot, inventory, relisted — each category divisible into the market segments. You could use some aspect of this report in a presentation to a client, and see how they react as they square their expectations with the data. New Castle is hovering around 32 on the MAI, and that number is measuring the momentum of the market. The number 32 is actually near the middle of the market, above 30, seller has a slight advantage and below 30, the buyer does. The dotted line is the data average for the last 7 days, while the solid line is the running 90 day analysis. The shorter time frame (dotted line) can serve as an indicator. Anyway, its 32 in New Castle means there’s a seller’s advantage, but its only slight. A unique fact emerges when looking at the New Castle data, which is in the comparison of market segments. More expensive homes in New Castle sold more quickly than lower priced ones. What good is the data if it doesn’t move us towards feeling confident about an action? So the $850,000 dollar question is, is now a good time for me to list? The reasons to go for listing in zip code 81647 are that demand exceeds supply, inventory is low, and prices have been on an upward trend. 3. Go back to dreaming about the enjoyment in buying— new views, new scenery, new tranquility, decorating!, up-cycling furniture; in other words, if you focus on the fun in homemaking– you’ll realize that in order to let your inner Martha Stewart seed blossom into a vibrant homemaking flower, you are going to have to list. In Sum: Be a seller, in order to turn yourself into a buyer, for epicurean reasons. Be a seller because there are lots of situations which people turn into buyers reluctantly. Landlords don’t accept pets, priced out of up Valley, got a divorce, got a new job in the area–these people are buying because they need a living situation in this zip code now. If you become a seller, someone who wants your home will find it. They will find it not always because they have homemaking fairy dreams and potpourri to heat up, but because they have to and its the right price point. Of course there is the other argument, which is wait if you can wait, because Glenwood Springs, New Castle, and Rifle are all good and going up. But then again, everyone lists in March so when you get around to doing it, the inventory will be higher which could cause the median home price to fall. And what is the right price point for listing? Well, talk to a real estate agent at Cheryl&Co who can look at and interpret the data for you, and not just the measures available on the Altos report. Your real estate agent has a variety of sources from which to draw data on neighborhoods, such as the RPR or Realtors Property Resource on the mls, and the mls itself generates reports. 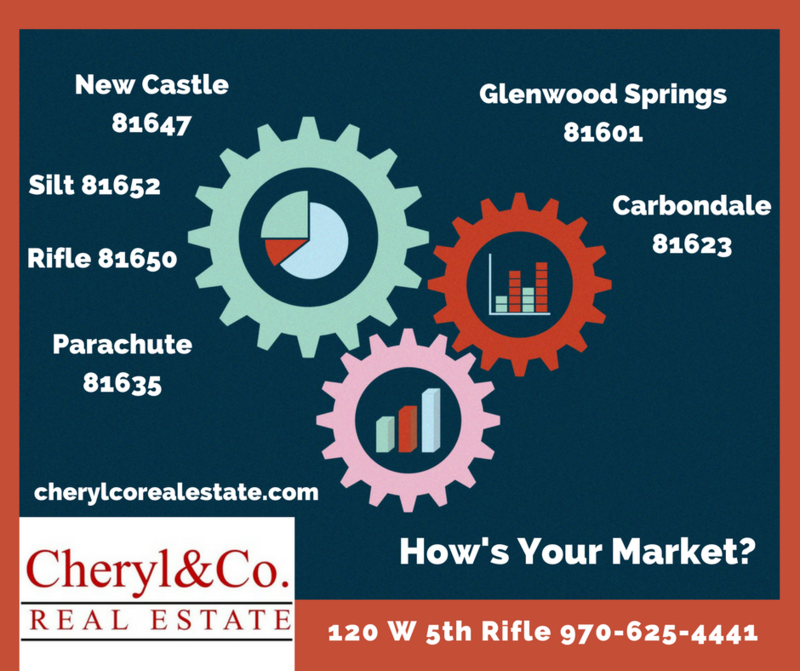 Your realtor at Cheryl&Co will know how to customize these reports for your neighborhood and take into consideration all of the varying details of your home in refining the comparison properties. Rest assured that these reports will be more accurate than what you are seeing on Zillow– because Zillow’s data is not as complete. Your agent will look for relationships between different measures like inventory and median list price in order to accurately picture the market. All of this data interpretation will help your agent advise you on the right price to list your home at. The agent has to get the seller the best price, but also move it on the life schedule of the seller, hopefully spending as few days on market as possible. Reports can inform what a given seller can expect to encounter in terms of days on the market before sale. Sellers, don’t dwell on the anxiety provoking issue of time on the market, dwell on the future that is beyond this house, the future you’ve decided to go for, after all, the next phase is the fun buyer phase. If you want to look around to get inspired for your buying phase, use the property organizer (use the search bar, then you can save a search) on our website, you can even sign up for notifications when a house fitting your criteria comes onto the market. Reports are really interesting but they don’t have predictive powers. I haven’t heard about any crystal balls being found around the Western Slope, but if I come across one I’ll let you use it to decorate. The thing about the market is that its healthy when its moving, just like water. Are you moving?